Steven Anthony Jones as Azell, Nancy Moricette as Abasiama. Photo by Jennifer Reiley. 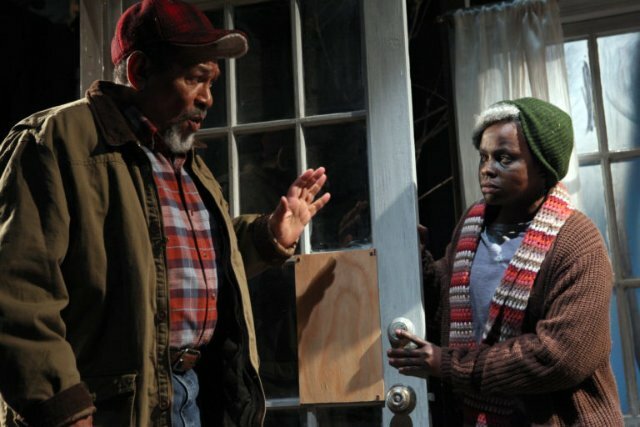 Playwright Mfoniso Udofia certainly exposes a central theme to her newest play with its title, In Old Age. Aging is inherently discomforting. Health erodes, strength declines, habits become entrenched. Two persons afflicted with similar ravages of age and who must share time together will likely engage in conflict if they embrace different sensibilities. With In Old Age, Udofia offers her fifth installment of a planned nine-play series about the Ufots, a Nigerian-American family. The matriarch of the family, Abasiama, lives alone in the long time family home in Worcester, Massachusetts that suffers from deferred maintenance. Her children have arranged for a handyman to install new flooring. What might otherwise proceed with a few bumps in the road becomes a major dustup between two obstinate septuagenarians. This two-hander is blessed with two remarkable performances. Nancy Moricette wails and moans as Abasiama – hostile, mystical, and accustomed to loneliness. Her years in this country have not eroded her accent or some of the practices from the old country. Moricette aptly displays Abasiama’s suspicion, rigidity, and her notion that inanimate objects such as flooring have characteristics of sentient beings. Steven Anthony Jones is every bit his counterpart’s equal as Azell. His hobbled motion and hangdog look perfectly represent the sense of a man who must continue to work and gains reward from it, but yearns for his physical state of 20 years before. Although he has his own inflexibilities, he shows a conciliatory and understanding side that makes him the more approachable of the two. One common weakness in domestic dramas is that the stakes are often too small to produce dramatic interest, which shifts the burden of the script to personal and relationship development. The conflict here concerns if, when, and how a new floor is going to be laid, which isn’t exactly of earth shattering consequence. Along the way, however, a relationship does evolve, through which character and secrets are revealed and lives are renovated. We also see the contrast between Azell’s generally stolid and plodding existence with connection to the outside world versus Abasiama’s cocooned life of spirits and secrets. Victor Malana Maog directs, just having directed Udofia’s Her Portmanteau for ACT, so he is certainly familiar with the playwright’s material and her detailed director’s notes and stage directions. Although the play fits comfortably in the common modern timing format of under 100 minutes with no intermission, the proceedings could be tightened a bit. Several long and circuitous entries by slow moving actors sap the pace. Otherwise, the character interactions appear natural, including dialogue overlap and occasional stuttering or blubbering that make it unclear whether they are directed or flubbed. Small laughs are triggered along with much anxiety. Creative design is excellent. Andrew Boyce’s expansive and versatile set opens the space beyond the living room being renovated, and it works well. Sara Huddleston’s soundtrack fills the house with eerie resonance and ominous rumblings though it is sometimes uncertain whether these represent Abasiama’s inner voices or real emanations from the mystery in the basement. Finally, York Kennedy’s lighting shifts are highly effective in representing both the indoors and outdoors. As part of a nine-play cycle, In Old Age and the multi-play aggregation from which it comes, beg particular analysis. The broader question is the standing of this Ufot family saga against other cycles. The obvious comparison is August Wilson’s Pittsburgh Cycle, which shares the commonality of exploring the African-American experience. However, Wilson’s design was that each of the 10 plays would represent a separate decade, and though some characters such as Aunt Esther recur, the plays are independent of one another and can be appraised accordingly. Udofia’s yet-to-be-completed cycle is truly a single-family chronicle, and its durability is yet to be determined. Greater appreciation of each play may come from seeing several from the cycle, which enhances the depth of understanding and allows that the whole may exceed the sum of the parts. In that regard, one deficiency of In Old Age is that the understanding of the family relationships is not enhanced. The only relationship of an Ufot family member that is depicted is with the workman, Azell, an unrelated person. We do, nonetheless, observe a compelling, if disquieting, portrait of Abasiama. In Old Age by Mfoniso Udofia, a world premiere commission by Magic Theatre plays on their stage at Fort Mason Center, 2 Marina Blvd. – Bldg. D, San Francisco, CA, through April 21, 2019.